What do mac and cheese, pizza and bowls of pasta all have in common? If you answered, “Umm, they’re delicious,” you’d be right. But they’re also heavy in carbs and can leave you feeling tired and annoyed. And while a diet rich in healthy carbohydrates is good for us in moderation, you might be itching to try something fresh. Don’t worry, we’ve got you covered. We’ve gathered some of the most notorious carb-heavy foods and found a delicious, low-carb alternative to satisfy any craving. 2. Easy Eggplant Lasagna If you love eggplant, this recipe’s for you. 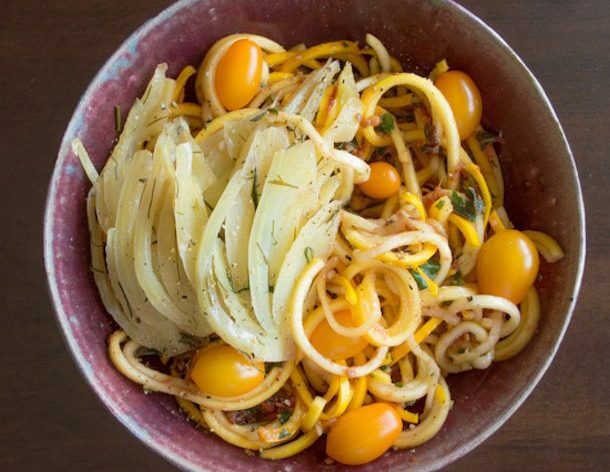 If you don’t love eggplant yet, you will after whipping up this pasta-free dish. It comes together quickly for a lasagna that’s got all the flavor of the familiar version without the carbs. It’s also insanely flexible: peel or don’t peel the eggplant and make the slices as thick (or thin) as you like. Use jarred pasta sauce to speed things up even more. Move over, cream- and butter-laden mashed potatoes—there’s a new side dish in town. This mashed cauliflower takes on the consistency of potatoes after getting chopped up in a food processor or blender (or use a potato masher to get chunkier “potato” pieces and work on your upper arm strength! ), so get ready to enjoy a favorite comfort food minus piles of carbs. The garlic and chives add an extra dimension of flavor that’s sure to be a hit. 9. Skinny Spaghetti Cabbage masked as spaghetti? Trust us, it works. The cabbage “noodles” lose their cabbage-y flavor, and become the perfect vehicle for this flavorful chili that uses staple ingredients like garlic and chopped tomatoes. Bonus: Use the leftover chili in a burrito, taco, or even eat it on its own.